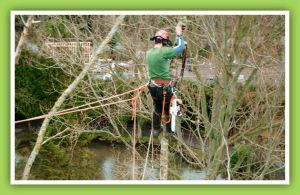 Greenfields have a highly skilled team of qualified tree surgeons at our Gloucestershire premises and are able to complete tree surgery jobs of all sizes. We carry out insurance reports and surveys as well as caring for trees. It's not just about cutting them down! Our team of aboricultural specialists are regularly involved across the full range of tree management projects, whether it's pruning or hedge cutting, larger tree reductions, reshaping trees and shrubs, cable bracing, tree felling or stump grinding. We also provide tree planting services and other positive environmental works. Greenfields work for private customers, schools, county and city councils, large companies, parish councils, housing associations, the local diocese and insurance companies. Based just outside Gloucester, Greenfields serve all England and Wales.